Looking for Power Washing in Jacksonville? One of the most economical ways to improve and maintain the appearance of your home or retail business is power washing the exterior surfaces. Power washing protects your home or business in several ways, while making it fresh and clean! Many areas require a "soft clean". Our soft wash techniques use light pressure, 25% of normal pressure, and application of safe, powerful cleaners & biodegradable detergents to ensure your surfaces are clean. ​We use powerful, yet environmentally friendly solutions. After applying the correct chemicals and allowing them to activate; the surface is thoroughly rinsed with low pressure, leaving behind a clean surface. These power washing techniques won't damage sensitive areas. Areas we use the soft washing technique are: shake or wood siding, fences and decks, coquina, screened enclosures, lanais, vinyl siding and roof shingles. A soft; yet very effective version of power washing. Many benefits exist for pressure washing your home or business. Exterior finishes will last longer is one result. Power washing improves ascetics, raises value, and also helps slow the aging and deterioration process. A thorough washing will rid mold, mildew, pollen and pollution to give your Jacksonville home or business a new look. In addition, power washing helps avoid the expense of costly wood rot repairs and painting as regularly. If your looking to sell or rent; power washing produces great curb appeal and adds value to your property. Think about maintaining or cleaning your roof surfaces. Out of sight, out of mind? We apply our roof cleaning methods in many ways. We use a soft cleaning method on shingle roofs and more pressure on tile or metal roofs. ​Roof stains are caused by algae called Gloeocapsa Magma. Algae, pollen, growth of any kind, will hold moisture that damages or rots your roof. It causes deterioration and ruins your roof by actually removing the colored or reflective asphalt granules that protect the shingle. 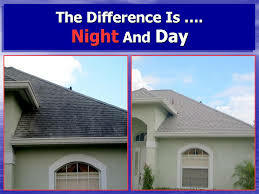 Also, the discoloration won't allow your roof to be reflective as it should and holds a lots more heat. Once this heat is trapped in your attic, it takes years of life from your roof, and it can kill your electric bill. Roof cleaning in Jacksonville is important. See how effective our roof cleaning services can be. Whether it's part of regular maintenance or getting ready for an exterior paint job. Jacksonville Power Washing pros know roof cleaning! A thorough Power Washing of your home is a must to prepare your house for painting. This is a vital for achieving professional results with exterior painting. Power Washing removes pollen, dust, chalky residue (efflorescence), algae, mildew, loose paint and debris so the new paint finishes will adhere properly. In addition, a good Power Washing provides a fresh, clean look to any home or business. Homeowners find it raises value, protects and maintains the home's surfaces. Also, business owners have reported a rise sales & customer traffic when properly maintaining the condition and appearance of their establishment. Jacksonville power washing can save you costly maintenance repairs while keeping everything looking fresh and new. Power washing in Jacksonville makes sense for any home and business. ​See the benefits Power washing can give you!